The summer sun supercharged green technology this week as Inhabitat reported that IKEA flipped the switch on a massive 65,000 square foot solar array and designer Markus Kayser unveiled an awesome self-sufficient solar-powered laser cutter. We also spotted a clever off-grid Tropicana billboard that is juiced by oranges, and we learned about a new piezoelectric film that could lead to laptops powered by typing. Energy-generating architecture also made headlines as SMIT announced plans to roll out their Solar Ivy system on several buildings and one designer unveiled plans for a green energy island large enough to power Copenhagen. 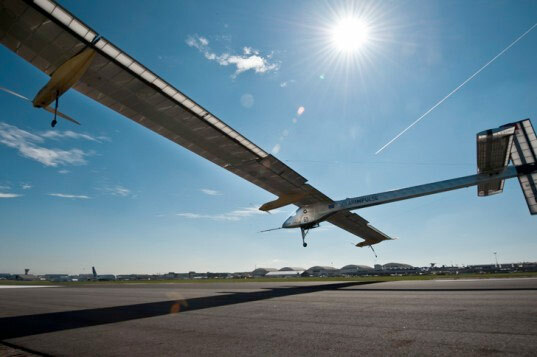 Green transportation also reached for the sky this week as the sun-powered Solar Impulse airplane made its public debut at the Paris Air Show and EADS unveiled plans for an innovative all-electric commercial aircraft. Efficient autos also hit the streets as the Nissan Leaf became the first electric car to tackle Pike's Peak, and we learned that Porsche is working on a new breed of cars that are able to drive themselves. If pedal-powered transportation is more your speed you won't want to miss this beautiful kinetic energy-storing Potenza vehicle, and we were wowed by the solar panel-clad Emax Excalibur hybrid yacht. In other news, we shined a light on green consumer electronics this week as we brought you a lunar LED light modeled after the moon and Peter Rojas explained how wasteful it is to keep gadgets chargers plugged in as part of our Ask a Tech Geek column. We also shared a low-tech tablet that's perfect for kids, and we showcased a new type of climate-controlled clothing that beats the summer heat. Finally, we were excited to see Sprint launch a contest where you can recycle your old cell to score a Vespa scooter and an eco smartphone, and we brought you seven sustainable designs for a greener Fourth of July. Inhabitat's Week in Green: IKEA's massive solar array, climate-controlled clothing and ultra-green yachts originally appeared on Engadget on Sun, 03 Jul 2011 21:07:00 EDT. Please see our terms for use of feeds.